Desert sunrise, Arctic tundra, nighttime urban streets: the look of your footage defines the mood. Now you can define the style of your video or film, regardless of on-set conditions, with powerful imaging tools. Choose from 100+ Look presets, to help set the mood for everything from a wedding to the next Sundance original. You also get the standalone Magic Bullet LooksBuilder, for pre-visualizing looks on set or anywhere. Portable presets load into any editing hosts, so the same Looks you create on set are the ones you finish with in the editorial suite: no need for an expensive finishing system. Magic Bullet Looks runs in a variety of host applications. For the first time, you can design and refine a look with a user experience that balances ease of use with the power of 36 distinct Look Tools. The new interface offers Quick Drawers for accessing tools and presets without taking up valuable space. Tool controls keep clutter to a minimum. Also, a linear-light processing engine provides fluid interaction using the power of your graphics card. More than one hundred unique Looks, conveniently organized by category in the Look Library, are a great starting point for defining the mood of any scene. The presets range from simple exposure and film process emulation to radical color changes. Best of all you can use the Look Theater to browse through the library using your own images � finding a look couldn't be easier. Magic Bullet Looks works as both a plug-in and a standalone application. The LooksBuilder plug-in accesses presets and renders looks inside a variety of popular editing software packages. The application lets you refine and create looks anywhere, from on set to your edit suite, using any image as a foundation. Go from pre-visualization to final output, all with the same look. A work environment that balances ease of use with the power of 36 distinct Look Tools that emulate how light is captured on film. Quick Drawers provide access to tools and presets without wasting valuable space. Unique linear-light processing engine and HDR support yield true-to-life results. 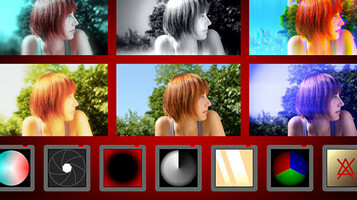 Organized by category, they range from simple exposure and film process emulation to radical color changes. Browse the looks library automatically, using your own images as a starting point. LooksBuilder works as either a plug-in or a standalone application. Customize one of the 100 presets with LooksBuilder, or create your own Look from scratch. GPU acceleration (using your ATI or NVIDIA card) delivers real-time playback with many Looks. Use either a trackball or trackpad for instant manipulation of a tool's controls. Handles SD, HD, 2K, and 4K images on standard hardware, or up to 8K x 8K pixels with the latest NVIDIA GPUs.